Magna Carta is 800 years old! On this occasion, the Franco-British Council organised, on Thursday 11 June, a conference entitled: “Magna Carta and the Déclaration des Droits de l’Homme et du Citoyen: Past, Present and Future”. This event, prepared in partnership with the Franco-British Lawyers Society and the Franco-British Connections association took place at Lancaster House. Agreed in 1215 by King John of England, Magna Carta (Latin for “the Great Charter”) is the founding text of British Law, considered as the enshrinement of the Rule of Law. Over the centuries, it influenced numerous constitutional constructions worldwide, including in Europe and in most Commonwealth countries. In 1965, the English judge Lord Denning described Magna Carta as “the greatest constitutional document of all times – the foundation of the freedom of the individual against the arbitrary authority of the despot”. Its French “equivalent”, the Déclaration des Droits de l’Homme et du Citoyen, written in 1789, identifies fundamental, natural and inalienable rights. Professor Robert Tombs explained: “France and Britain have strongly contributed to shaping the way the rest of the world thinks about rights and freedom”. 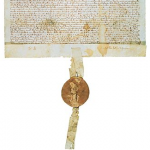 The 800th anniversary of Magna Carta is a great occasion to compare both documents (or should we say “events”?). Both are iconic texts, written in completely different historical contexts. Magna Carta is not as ambitious as the DDHC, explained the British Supreme Court Judge Lord Sumption. It is a document for free, male and relatively rich British people, rather than for the population as a whole. But “Magna Carta is not important because of what it says, but because of what people think it says”, he declared. Magna Carta and the DDHC can also be relevant in numerous current social and political debates. Regarding the British position within the EU for instance, Sylvie Goulard, a French Member of the European Parliament, underlined the fact that the UK had a lot to teach Europe about democracy. She said she hoped the UK citizens would decide to improve the European debate, rather than leave it. Jean-Paul Costa, the President of the International Institute of Human Rights, also argued that recent terrorist attacks had demonstrated the fragility of European democracy. Tchetchnia, Kosovo, Cyprus, Ukraine… the EU is not short of violence and conflicts. Magna Carta and the DDHC can therefore be used as examples of founding texts which can still be used at a European level. During panels and round tables, attendees got the opportunity to take part in the debate. Among the participants: politicians, judges, law experts, university professors, but also students - some even coming from Paris for the occasion. Katerine, who studies Law with French, was glad to get the opportunity to take part in this debate, which gave her “an in-depth look into the topic with reknowned experts”. The journalist and PhD researcher Myriam François-Cerrah, considered the symposium as a rare opportunity for French people to listen to what Ango-Saxons think of their home affairs. The Magna Carta 800th Anniversary Committee concluded: “the 800th anniversary of Magna Carta is an occasion to deepen understanding of the crucial role it has played in our development. It is a time to commemorate the individual rights we enjoy today and an opportunity to strengthen human rights around the world”.